[S49] UK National Census for 1881 Index, UK "RG11 Piece 3758 Folio 103 Page 18." [S2260] UK National Census for 1911 for UK, "RG14PN22260 RG78PN1316 RD454 SD3 ED9 SN117." [S45] Website FreeBMD (http://freebmd.rootsweb.com/) "Deaths Sep 1916 Hanlon James 48 Toxteth P. 8b 262." Four generations. 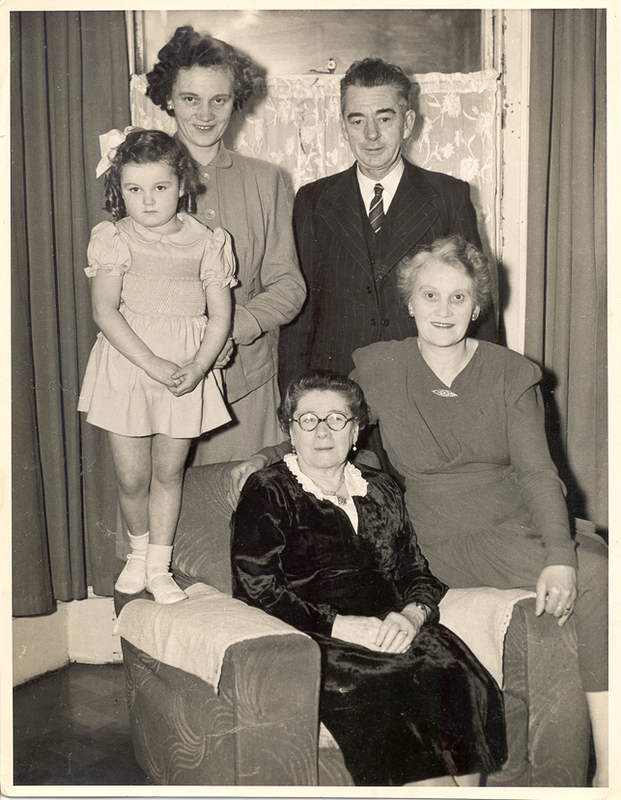 Seated, Mary Andrew Hanlon (née Crawford), seated on the arm of the chair Maggie Hanlon (née Jones) her daughter in law, standing behind Maggie is Hugh Austin Hanlon, her husband and son of Mary Andrew Hanlon, beside Hugh Austin is Peggy Swindell (née Hanlon) the daughter of Hugh and Maggie Hanlon and the first of their eleven children, and standing on the other arm of the chair Margaret Swindell, the daughter of Peggy, granddaughter of Hugh and Maggie, and great granddaughter of Mary Andrew Hanlon. The photo was taken at Mary Andrew Hanlon's house the day after the marriage of Alma Hanlon to Bunty Spreag. [S2] UK National Census for 1871 for UK, "RG10/3679 f11 p19 93." [S549] Microfilm Marriage, St Mary (Alderley), 1837-1901 "p154/307." [S37] Website Cheshire BMD (http://cheshirebmd.org.uk/) "ASM/1/307." [S2] UK National Census for 1871 for UK, "RG10/3679 f13 p23 112." [S302] Microfilm Marriage, St James (Didsbury), 1838-1881 "p68/135." [S40] UK National Census for 1851 for UK, "HO 107/2156 f420 p26 72." [S76] UK National Census for 1841 for UK, "HO 107/581/7 f45 p36." Source: FHL Film Dates: 1814 - 1824. Source: FHL Film 1751722 Dates: 1829 - 1833. [S2] UK National Census for 1871 for UK, "RG10/3689 f83 p25 110." [S2] UK National Census for 1871 for UK, "RG10/3689 f83 p25 110. [S2] UK National Census for 1871 for UK, "RG10/3690 f72 p18 2."